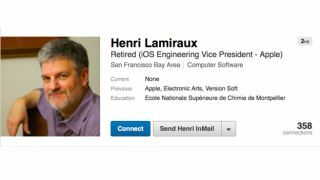 Apple's Vice President of iOS Engineering, Henri Lamiraux has left the company after 23 years, it emerged this weekend. After changing his employment status to 'Retired' on Facebook and LinkedIn, Lamiruax confirmed to 9to5Mac that he had indeed left the company he first joined back in 1990. Lamiraux, who'd been officially woking on iOS since 2005, was in charge of developing the applications which come with the software, according to reports. "The executive also led feature-implementation across the operating system, and he managed both bug-fixing processes and feature distribution to consumers. He also managed the frameworks within the operating system that power features and allow developers to build applications." 9to5Mac wrote.